How about a third minister for Smithville? Late last fall, I believe it was, a Consistory Press Release printed in the Family Post related that one of our members had dropped a letter on Consistory’s table suggesting that our congregation invest in community outreach. Perhaps, that letter hinted, we should call a minister specifically for home mission work in Smithville. With a minister and a foreign missionary already on the books, that’d give us a third minister. What should Consistory do? As the Press Release indicated, Consistory thought it wise to mandate the Home Mission committee to do some research into such matters as need and possibilities. I have no doubt that the Home Mission committee has subsequently been scratching its collective head to come up with a good, Biblical response to this suggestion. Then again, maybe the Home Mission Committee shouldn’t do all the thinking. How about some conversation over coffee as we think along with the committee? Would you think it a good idea to focus on home mission work in Smithville? If yes, why? And how? If no, why not? For my part, I’ve been thinking in the months since that idea was tabled about a speech I heard in Hamilton last January, and been looking for a moment to put some thoughts to paper. That speech had, in my opinion, some ideas that could help is in thinking through some of the aspects of the question. Now that I have a moment (ah, the benefits of an airport layover!) I’d like to share with you some bits and pieces I learned from Rev Bill Boekestein, minister of the Word of God in a 60-member United Reformed Church in Carbondale, PA. He was at the Seminary in Hamilton at the request of the faculty to speak about the outreach work his congregation does in their (working class) community. Rev Boekestein distinguished between evangelism and outreach. He chose to define outreach as things you do before you engage in evangelism. ‘Outreach’ is what you do as you reach out to the community so that connections and conversations are eventually possible. Barriers may exist between the church and the community, and it is only if these barriers have come down that neighbors will be open to conversation and even come to church. 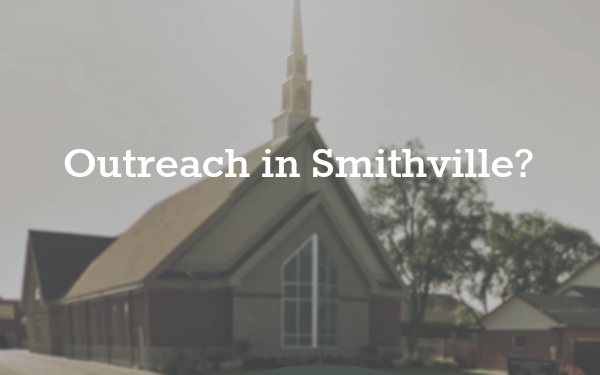 I think it’s true that in Smithville too some barriers exist between the (Canadian Reformed) Church and the community that makes conversation about the faith awkward, and coming to church a downright hurdle for many. So I was interested in Rev Boekestein’s thoughts about how to reach out. Rev Boekestein suggested each church develop a plan – not unlike what happens in every other part of life (be it business, education, etc) to help achieve one’s goal. To support his suggestion for an outreach plan, he appealed to Paul’s action as described in Acts 19:21 where Paul “resolved in the Spirit” to a particular course of action in his missionary journey. The term translated as “resolved” actually means to “strategize”. Paul made his plans “in the Spirit”, and that’s to say that he subjected his plans to God’s revealed will. Even so, he deliberately paused to think about, to plan a course of action that would help to promote the spread of the gospel. The goal we seek is that persons of the community come to know the Lord and so join His church. That, of course, involves them attending church. As Boekestein neatly put it: “church growth happens when visitors become members.” And that, he added, would form the basic work plan. So there’s the question that needs addressing: how can one get the people of our community to come to church? What plan would you make to bring about that goal? His answer was that we need to advertise – though not, Boekestein hastened to add, in the commercial sense of the term. The advertising he’s referring to is the deliberate effort the church members make to make ‘their’ church look attractive to the community. Of course, the gospel message (the reality of sin, the crucifixion of the Savior) is not attractive to the sinner, and obviously may not be altered to make it more attractive. But there are, he argued, things the church members can do to make the church members, and so the church community, look less threatening to the community. The brethren in Carbondale, he explained, are very deliberate in raising with the community the public profile of the United Reformed Church so that this church’s reputation is distinctly positive, appealing and attractive. In Carbondale the goal is that when the residents of town think ‘church’ they automatically think of the United Reformed Church of Carbondale. So when they need the church, that’s where they’ll go. That’s what he means by advertise. Members and office bearers develop personal contact with the locals. This happens through the neighborly across-the-fence sort of chats. It happens also through deliberately organizing events where you cannot help but meet the neighbors. Things like hosting a street BBQ, or offering a baby-sit service at Poultry Fest come to mind. Members (under consistory’s leadership) need to develop and maintain a positive, exciting mindset about the church. It is instructive that though Paul has some very critical things to say to the churches to which he writes his letters, he repeatedly begins with words of thanksgiving for what God has given in that congregation. Having a positive mindset about ones church (despite the weaknesses that are undoubtedly present) is critical because how you feel about the church will come out in your conversations with neighbors. They will not come to church if they sense the members are critical of the church, its members or its leaders. Sunday’s sermons can be recycled for the benefit of the community, for example, by placing CDs or DVDs of the sermon in strategic locations in the community (eg, post office, doctor’s office, hair stylist’s, etc), and making it clear they’re for the taking. It would require, of course, that the church’s name and other vital information be printed on each CD/DVD. Sound bites could also be taken from the sermon and put on utube. Distribute a survey and/or questionnaire in the community that gets people thinking about the big questions of life. This can in turn generate talking points with the neighbor. Somebody from the church should attend every town council meeting and other community meetings. Such attendance and participation expresses to the community that the church and her members are interested in community needs and developments. This person could also drop hints to church members and/or the deacons of a particular community need that we could service. The church could undertake projects that the community would clearly see are for the benefit of the community. The URC in Carbondale took it upon itself to paint the dilapidated play equipment in a community park, and as the members did so they wore T-shirts bearing the church’s name. For contact purposes they invited the area neighbors to help along. Prayer in church should include petitions for the community, including particular community needs. That prayer should also petition the Lord to grant opportunity for conversation, inroads for the gospel, and converts. The church’s website needs to be visitor-friendly. The opening page of the website ought not to be put together for the benefit of the members, but for the benefit of web visitors who may be browsing around looking for information on that church that’s so interested in the community. In today’s world, it’s the website that provides visitors with their first impression of the church, and so needs to be good – and updated frequently with pointers to new material. In relation to the physical facilities of the church, Rev Boekestein challenged us to think like an outsider. Is there anything intimidating about the parking lot, the walk to the building, the doors, etc? Rev Boekestein argued that it is an uncommonly nerve-wracking experience for a visitor to come to church, and it doesn’t take much to scare him into driving away again. Let greeters, then, be outside the building, immediately welcoming the newcomer in a genuine manner. Inside the church signage should be clear and assistance offered so that the newcomer feels relaxed and included. Expectations in the church service too should be made plain to him. A new members’ class should be in place and operating, or ready to kick in as soon as necessary. This requires competent instructors, with a prepared course. The church building could be used during the week to offer courses on topics that could be of interest to the community, eg, adjustment to retirement, widowhood, budgeting for home ownership, etc. Such efforts could establish contacts, and serve to lower the threshold of the church in the mind of the community. The church budget absolutely has to have a generous though responsible amount set aside for this ‘outreach’ work. The budget, after all, expresses what the church really thinks on this matter. None of these thoughts, Rev Boekestein pointed out, are magic, and not all are as good as the next. As the weeks and months go by, it’s imperative to rethink the approach being taken to see if there are ways to refine it. A community, after all, is dynamic and living, and with change comes new opportunity. But behind all outreach effort needs to be the conviction shared by the church membership that the church has the best thing happening in town. But behind all outreach effort needs to be the conviction shared by the church membership that the church has the best thing happening in town. In church one hears to Word of life, and embracing that Word gives the answers to life’s hard questions. That conviction should prompt all –according to gifts received– to go all out to make Word as accessible as we can to those around us. Well, that’s the drift of Rev Boekestein’s speech. Are there things here we can work with? I have no doubt there are. So I would much encourage us to pick up this topic around the kitchen table and in our coffee klatches. No, let’s not wait for the Home Mission committee to do the heavy lifting on our behalf. Let’s instead help them in their thinking. Or better: let’s take initiatives ourselves. After all, we are convinced –aren’t we?– that we have the best act in town. And let’s pray for the Lord to show the way, and bless what we try to do.